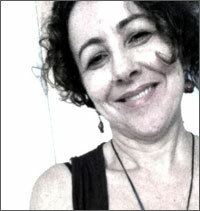 Victoria Cattoni is an Australian-born visual artist and independent researcher. Her most recent work is the project, ‘Salsa on 9’, which was exhibited and work-shopped in 2012 in Bandung, Indonesia. She has also during the past two years, begun a series of paintings which she plans to exhibit, after a hiatus of more than a decade of exhibiting her paintings. Born in Ingham in north-eastern Queensland, Cattoni has lived and worked in Hobart, Sydney, Darwin, Brisbane and Melbourne within Australia. In 1998 she relocated to Indonesia where she was based until 2004, following which, she worked in Malaysia for three years. She is currently based in Singapore. SALSA ON 9 & related works: Video based work ‘Salsa on 9’ takes a sideways step from Cattoni’s recent research project REDRESSING THE VEIL that examined perceptions of Muslim women’s dress, cheekily combining the ‘hijab’ with ‘salsa’, the dance. PAINTINGS FROM OBRAS RESIDENCIES 2012-2013: These works include watercolour on paper and oils on canvas. While a departure from her major arts practice and concerns, these works present a return to a creative approach Cattoni has not used for more than a decade. CULTURAL DIFFERENCE, is an ongoing quasi-documentary video work that interrogates the term ‘cultural difference’ and its usage – use, misuse and abuse – through a series of personal interviews. Krisna Murti, 2003, ‘Realitas Dalam Video dan Performance’, Kitsch, Edisi#4, Mei-Juni, pp. 6-7.